The planet Venus is named after the Roman goddess of beauty and love. To the Greeks she was known as Aphrodite. She is perhaps the most ancient and primal of all the goddesses around the world, and has had many names over the millennia. She is often referred to as the Goddess of Love, and the Goddess of Generation due to her creative powers of attraction, abundance and prosperity. She is associated with the lush fertile greenness on our planet, and the life giving force it provides to animals and humankind. 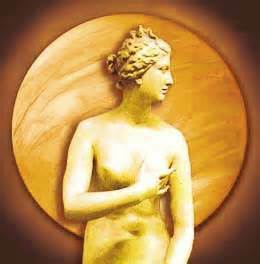 Venus expresses love in the world by drawing to her the prima materia to bring Spirit into physical form. She provides warmth and substance. She holds, cares and preserves the seed: the embryo form of beauty gestating in our earthly world. As an archetypal figure Venus embodies the power of spirit to attract and animate matter. Venus represents our ability, as spiritual beings having a human experience, to manifest the beauty of spirit through our corporeal selves and by working with material resources in the world to create tangible objects of practical beauty. The glyph for Venus, sometimes called the “Mirror of Venus,” is the circle of spirit over the cross of matter. It represents the infusion of spirit into the material world through cosmic love. Martin Schulman in his book Venus, The Gift of Love explains with spirit presiding above matter, the law of what is above pouring into what is below can manifest. Spiritual essence is always elevated above physical existence. When the two are connected and integrated in our life we experience beauty. If we identify too much with the cross of matter, we distance our self from our own spiritual nature. If we identify too much with spirit, we have difficulty grounding our self and finding outlets for spirit to express itself through our physicality. Venus is the ruling planet of the sign of Taurus. Through Venus we connect to the world around us via our physical body and its senses. Glenn Perry in The Zodiac as a Developmental Stage Model correlates Taurus with the very early stage of life when we develop an awareness of our body and its functions. We begin to develop some level of control over it while experiencing pleasure through its senses. We become aware that the world external to our self can be unpredictable, changeable, frustrating, and even unsafe. In response, we develop an urge or need to feel secure, safe, and to seek stability and constancy. We develop an appreciation of and attachment to objects that provide us with a feeling of security. We want to acquire and possess them as our own, so we can feel permanence and stability, peace and serenity. Venus determines our natural instinctual physical needs and desires. She defines our ability to experience comfort and contentment in the physical world. She reveals our natural talent for experiencing pleasure. She indicates the tangible possessions and material goods we are attracted to for the abundance and security they represent to us. She defines what we find valuable. She represents what we appreciate and love for the beauty and physical connections they provide in our life. Venus rules prosperity and our capacity for enjoyment. She gives us the power to draw towards us what we desire. She encourages us to validate and fulfill our personal needs and desires for sensual and sexual gratification. She wants us to receive pleasure, to delight in the good things of life, and feel good about it. If we do not feel prosperous we may become jealous, possessive and greedy. If we are too attached to the material world we can become vain, self-indulgent and lazy. If our Venus urge is denied or unfulfilled we can become covetous, lustful and even vindictive. Venus rules the early stages of sexual attraction and union. She determines our personal desires and receptivity to a potential sexual partner. In a woman Venus represents what is important to feel feminine, sensual and attractive. Venus is often projected in a man’s chart. It represents what he needs in a woman to feel attracted to her and help him understand his anima, his own Venus energy. The first stage of sexual attraction involves personal magnetism, pheromones and hormones. The unconscious biochemical attraction or repulsion we feel towards others is the initial “Venus phase” of a relationship. When we experience the right “chemistry” and are attracted to another, we experience an urge to gratify our Venusian needs and experience pleasure. The Venus phase of a relationship usually lasts 6 months to a year, one cycle of the planet Venus through the zodiac. Once this early stage of relationship is over, other forces and drives must come into play for a relationship to continue and blossom.